Pete Carroll and Jim Harbaugh on Ray Rice: The Seahawks and 49ers coaches are domestic violence hypocrites. Pete Carroll and Jim Harbaugh say they don’t abide domestic abuse. So why do the Seahawks and 49ers have a combined six players accused of violence against women? 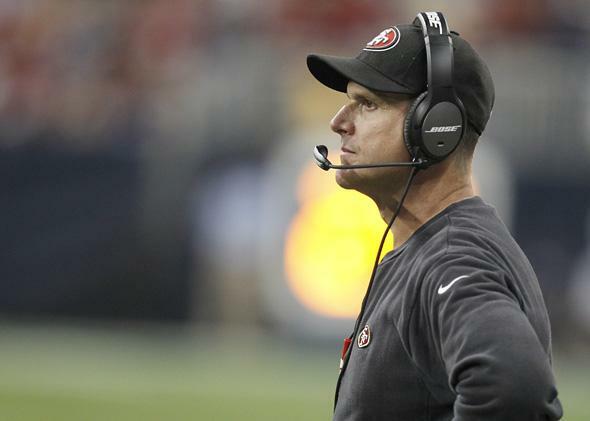 Jim Harbaugh of the San Francisco 49ers coaches against the Houston Texans on Aug. 28, 2014, in Houston. Carroll and Harbaugh are great examples of how it’s easier to say the right things than it is to translate words into deeds. Despite Harbaugh’s supposed lack of tolerance for domestic abuse, McDonald—who was arrested when police found bruising on his pregnant fiancée’s arms and neck—continues to play for the team. While Carroll and Harbaugh make lofty claims, in practice the Seahawks and the 49ers both demonstrate the NFL’s typical policy toward domestic violence: Go ahead and keep playing, so long as there’s no video. With the help of Slate intern Emily Tamkin, I looked through two databases of arrests and criminal charges brought against NFL players. Using data from USA Today and the San Diego Union-Tribune, we collected information on active players who have been charged with or arrested for domestic violence, sexual assault, or assaults against women. The 49ers lead the league with four such players. The Arizona Cardinals have three; one of those men, Chris Rainey, is on the team’s practice squad rather than the 53-man roster, while another, Daryl Washington, is currently serving a suspension for a substance abuse violation. The Super Bowl champion Seahawks, like the Chicago Bears, have two. (The Ravens also had two until they cut Rice.) By our count, nine additional teams have at least one player who has been charged or arrested for such a crime, a number that is down from the last time we did this count in 2012. Keep in mind, though, that we’re only counting arrests and criminal charges, meaning this tally does not include players like the Ravens’ Terrell Suggs, who was accused of domestic abuse on two occasions but was never charged with a crime. I contacted the 49ers, Cardinals, and Seahawks to ask them about their policies on domestic abuse, whether they considered a player’s history of domestic violence when pursuing a free agent, and if they had any policies in place to handle such players. None of the teams has substantively responded to my requests. I will update this piece if any of them does so. There are manifold problems with falling back on “due process” in domestic violence cases. As Diana Moskovitz points out in a fantastic piece for Deadspin, the victims of domestic abuse often recant, because their boyfriends or fiancés or husbands are “changed men” and “will act better now.” And recall that even though there was video of Rice brutally assaulting Janay Palmer and then dragging her unconscious body, he was still allowed to enter pretrial intervention and avoid jail time. As Emily Bazelon explains, even with video of Rice knocking her unconscious, prosecutors would have had a hard time scoring a conviction without Palmer’s testimony. Like most employers, NFL teams don’t require that a legal process play out before administering a punishment to one of their employees. The “no tolerance” 49ers could fine, suspend, or release Ray McDonald today on account of the bruises on his fiancée’s arms and neck. But that hasn’t happened. At least until the Ray Rice elevator video was released to the public, the NFL and teams like the Ravens could use the legal system’s leniency as an easy excuse to mitigate Rice’s punishment: The courts didn’t punish him all that severely, so a two-game suspension sounds about right. This is how NFL players accused of domestic abuse skate by with few (and often no) consequences. Just look at the rosters of the 49ers and the Seahawks. Under Harbaugh, Brooks signed a six-year, $44.5 million contract extension in 2012. In 2013, according to the San Jose Mercury News, “Brooks allegedly struck 49ers nose tackle Lamar Divens three times in the head with a beer bottle and then punched him in the face during an argument over car keys outside Brooks’ house in San Jose. The alleged attack left Divens bloodied and requiring three stitches, according to court documents.” Brooks was not charged after Divens told police it “would be bad for both their careers” and questions were raised about whether Brooks was acting in self-defense. There have been no public reports that Brooks has ever been fined, suspended, or punished by the 49ers. (Also, the Cincinnati Bengals never suspended Brooks for the 2008 attack, which took place when he was still on that team.) Brooks was a Pro Bowler last year. In 2010, Perrish Cox was charged with sexually assaulting a woman in his apartment. The woman became pregnant, and DNA tests indicated that Cox was the father of the child. Nevertheless, Cox was acquitted in 2012, and the 49ers signed him less than two weeks later. (They signed Cook one day later.) In Sunday’s season opener against the Dallas Cowboys, Cox had three tackles and an interception. Two players who are now on the Seattle Seahawks have pleaded guilty or no contest in cases stemming from domestic disputes. In 2005, defensive tackle Kevin Williams was charged with domestic assault after his wife called 911 and police found “blood on her white T-shirt and two lacerations on her left forearm,” according to the AP. The AP story reports that Williams’ wife “said her husband was mad at her because she wasn’t wearing her wedding ring. She said she hit him between the eyes with her cell phone to get him off her, and that he then flung her across their bed. She said she hit the bedstand and fell to the ground.” Williams was placed on probation for a year after pleading guilty to disorderly conduct; he was never suspended by his team or the league for the domestic abuse. Williams signed with the Seahawks earlier this year and played in Sunday’s opening win against the Packers. Defensive tackle Tony McDaniel was charged with domestic violence in 2010. According to the Palm Beach Post, McDaniel and his girlfriend “were arguing over unanswered phone calls and a late night of partying, according to McDaniel’s arrest report. … He grabbed her purse and pushed her to the pavement, where she hit her head as they struggled over the bag, the report said. She ran into the house, told their guests to call 911 and, according to the report, ran back outside, where he threw her phone to the ground, shattering it.” Though McDaniel told a different story, “houseguests told police they witnessed the couple arguing, and McDaniel throwing Smith aside, grabbing her phone and smashing it.” McDaniel pleaded guilty to disorderly conduct and was suspended for one game by the NFL. The Seahawks signed him to a free agent deal in 2013. He recorded a safety last week against Green Bay. Jefferson’s case shows that NFL teams have a lot of latitude in how they handle players who are charged with domestic assault. The Vikings didn’t wait for “due process” to play out. Instead, they released the cornerback three hours after he was booked into jail. In March of this year, Jefferson pleaded guilty to a misdemeanor. Two months later, the Seahawks signed him. So, why do the Seahawks now have just two players on their roster with a history of domestic abuse allegations? A month ago, Jefferson sprained his ankle. Seattle placed him on the injured reserve list shortly thereafter, and then waived him after reaching an injury settlement. This is how the Seahawks and most other NFL teams operate. If a player is accused of domestic violence, they keep him on the squad. If he’s injured and can’t take the field, then it’s time for immediate action. Why wait to see how the healing process plays out? An NFL roster spot is just too valuable to waste on someone with a sprained ankle.